Most information on this page comes from A Cloud Guru's Certified Solutions Architect Course. The cloud enabled quick experimentation without danger. This is the cloud's power. A region is a geographical area. It's a physical location in the world which consists of 2 (or more) availability zones. An availability zone (AZ) is one or more discrete data centers, each with redundant power, networking and connectivity, housed in separate facilities. The availability zones are far enough apart that an issue in one shouldn't affect another. 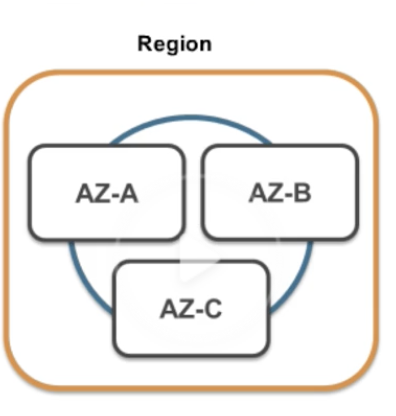 Edge locations are endpoints for AWS which are used for caching content. Typically this consists of CloudFront, Amazon's Content Delivery Network (CDN). There are many more edge locations than regions. Currently there are over 96 edge locations. Everything else sits on top of the AWS Global Infrastructure. EC2 (Elastic Compute Cloud) Virtual machines inside the AWS platform. EC2 Container Service Create and run Docker containers at scale. Elastic Beanstalk Automatically handles the deployment of your code (from capacity provisioning, load balancing, auto-scaling to application health monitorying) based on the code you upload to it. Lambda Function-as-a-Service (FaaS). Upload code and choose when it executes. No need to manage virtual machines or any system. Lightsail Amazon's VPS (Virtual Private Service). Lightsail is a very watered down version of EC2 that manages security groups for you. Batch Batch computing in the cloud. S3 (Simple Storage Service) Object-based storage. Files are uploaded into buckets in the cloud. Can storage and retrieve any amount of data. EFS (Elastic File System) Network attached storage (NAS) in the cloud (attaches to EC2 instances). Snowball Petabyte-scale data transport solution. Transfer of large amounts of data to AWS (with a physical disk). Storage Gateway Virtual appliances (VMs) installed in your data center which replication information on S3. A hybrid storage service that enables your on-premises applications to seamlessly use storage in the AWS Cloud. RDS (Relational Database Service) Offers SQL, MySQL, MariaDB, PostgreSQL, Aurora, and Oracle. Red Shift Data warehousing and business intelligence. AWS Migration Hub Track your services as you move them to AWS. Provides visualization. Application Discovery Service Automated set of tools that detects what applications you have and what their dependencies are. (DMS) Database Migration Service Migrate databases to AWS. Service Migration Service Migrate virtual and physical servers to the AWS cloud. Snowball Mentioned above. Sits between storage and migration. VPC (Virtual Private Cloud) Think of it like a virtual data center. You'll configure firewalls, route tables, etc. A Virtual Private Cloud (VPC) is a virtual network dedicated to a single AWS account. It is logically isolated from other virtual networks in the AWS cloud, providing compute resources with security and robust networking functionality. CloudFront Amazon's content delivery network. Think of media assets, if you have these stored in London and your user is in Australia, they can access it from an edge location instead. Route53 DNS service (if you look up a domain you'll get an IPv6 address). API Gateway A way of creating your own APIs for your other services to talk to. Direct Connect A way of running a dedicated line from your office into Amazon and connect into your VPC. CodeStar Way of getting a group of developers working together. Project management for collaboration. CodeCommit Place to store code. Source control service. Store git repositories. CodeBuild Compile and build code. CodeDeploy Automates deployment to EC2, on-premise, and lambda. X-Ray Analyze and debug serverless applications. CloudFormation Automated provisioning engine designed to deploy entire cloud environments via a JSON script. A way of scripting infrastructure. CloudTrail Log changes to your AWS environment. Config Manages configuration of you entire AWS environment. OpsWorks Configuration management service that uses Chef, an automation platform that treats server configurations as code. OpsWorks is effectively a way of automating your environment. Service Catalog Manages a catalog of IT service that are approved for use. Usually used by big organizations. Systems Manager An interface for managing your AWS resources. Typically used for EC2 (e.g. patch management). Trusted Advisor Will give you advice around different environments. e.g. security risks, how to increase performance, ways to save money. Elastic Transcoder Changes media so that it works well on different devices. MediaLive Live video processing service. Used for streams. MediaPackage Prepares and protects videos for transfer. MediaStore Storage system for media. MediaTailor Allows you to do targeted advertising for video streams. SageMaker Makes it really easy for developers to use deep learning. Comprehend Does sentiment analysis around data. DeepLens Artificially aware camera. It's a physics piece of hardware. Machine Learning Give it a data set and predictions. Makes new predictions. Polly Turns text to speech. Rekognition Upload a file and it will tell you what's in that file (visual classification). Amazon Translate Just like Google translate. Amazon Transcribe Automatic speech recognition. Athena Run SQL queries against things in a S3 bucket (e.g. an excel file). EMR Process large amounts of data efficiently. Kinesis Amazon Kinesis is used to collect, process, and analyze real-time, streaming data. A way of ingesting large amounts of data. QuickSight Fast, cloud-powered business analytics service that makes it easy to build visualizations, perform ad-hoc analysis, and quickly get business insights from your data. Business intelligence tool. Data Pipeline Move your data between various AWS services. Cognito Device authentication that gives temporary access to AWS. GuardDuty Monitors for malicious activities on your account. Inspector An agent that's installed on your virtual machines or EC2 instances. Gives a security report. Macie Scan S3 buckets and look for personally identifiable information (PII). Certificate Manager Get SSL certificates for free. CloudHSM Hardware security module used for storing private/public keys. Directory Service Way of integrating Microsoft active directory services with AWS services. WAF (Web Application Firewall) Like a layer 7 firewall. Stops things like cross-site scripting, SQL injection. Artifact Used for audit and compliance. Way of downloading and inspecting Amazon's documentation. Mobile Hub Management console. Will setup AWS for you. Pinpoint Way of using targeted push notifications to drive engagement. AWS AppSync Automatically updates the data in web and mobile applications in real time. Also updates offline users when they reconnect. Device Farm Way of testing your app on real life devices. Mobile Analytics Analytics for mobile! Sumerian A language and common set of tools for AR/VR. Step Functions Way of managing lambda functions. SNS (Simple Notification Service) TODO. SQS (Simple Queue Service) Way of decoupling your infrastructure. SWF (Simple Workflow Service) TODO. Connect Contact center as a service. Call center in the cloud. SES (Simple Email Service) Scalable email. Alexa For Business Use Alexa to dial into meetings, contact IT, etc. Chime Video conferencing. Similar to Google Hangouts. Work Docs Like a dropbox for AWS. WorkMail Similar to Gmail or Office365. Workspaces VDI solution. Running an operating system in the cloud. Desktop-as-a-Service (DaaS) solution that runs on AWS. AppStream 2.0 Way of streaming applications from the cloud. Amazon FreeRTOS An operating system for your microcontrollers. Greengrass Software that let's you run local compute messaging, data caching, sync, and machine learning interface capabilities for connected devices in a secure way. GameLift Develop games in the cloud.